Thank you for your interest in becoming a vital part of the blood collection process! About 60 percent of the community’s blood supply is collected at community blood drives, hosted by community members like you. CRBS has the equipment to conduct a blood drive inside your facility or on one of our bloodmobiles. One of our Donor Resources Consultants will be happy to discuss with you what would best suit your needs. Click here for blood drive information packet. To find out more information about coordinating and sponsoring a blood drive, call 1-877-24-BLOOD or email us. THANKS TO ALL OUR BLOOD DRIVE SPONSORS! CRBS relies on our community partners to help us maintain a constant supply of blood for our community hospitals. 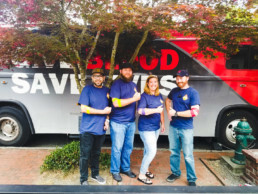 About 60 percent of the community blood supply comes from blood drives hosted by businesses, schools, churches and civic organizations. We are grateful for our volunteer blood drive coordinators who work so hard to make these blood drives a success!